If we face the truth without shielding our eyes, we know that content marketing is about making money. Whether for SEO, brand awareness, or lead generation, ultimately we are creating content to increase the weight of our wallets (or those of the businesses for which we work). So how do we do that better? Are there ways we can be creating content that specifically encourages a purchase or conversion? In this article I hope to answer that question with a 10-point “Yes!” I’ll address the 10 approaches you can use to increase conversions when creating content or writing copy. I imagine we’re all very tired of hearing, “Use emotion when writing content,” so I won’t say it (though it’s true and cuts to the very heart of writing for conversions…). What I’ll say instead is, “Use emotion to motivate,” which is more specific and therefore more useful. The goal of writing good content is not, it turns out, to encourage someone to feel any old emotion. The goal is to encourage someone to desire. Peer pressure: In this increasingly socially-conscious online world, knowing that other people are experiencing the same things you are, are engaging in things you aren’t, or are “liking” things you should be aware of is an incredibly powerful marketing force. Self-improvement: People want to be the best at what they do. As a result, try framing your content in terms of, “10 Things you Don’t Know About…“, “Things you Missed About…” or “Ways to Make You Awesome at…“. Fear of missing out: Fear is advertising and marketing’s great motivator — particularly the fear of missing out on an opportunity. Fear elicits a desire for insight, secrets, or loopholes. Consider the success of blog articles like, “How I Increased Page Conversions by 250% and Drove $500,000 in revenue!” in gaining your attention. Some of you may be familiar with the “LIFT” model for conversion optimization. Normally associated with landing pages, the five points are just as applicable when writing for conversion as they are when designing for it. You may be more familiar with it as an airplane, but I’ve decided to go with a flying car, ’cause why not? 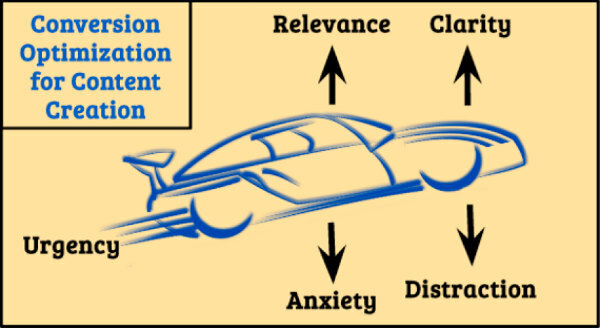 The next five points of content optimization are all related to this flying car model. Limitation on time or availability. A fear of missing out. These aren’t just factors you need to be implementing in your online ads, landing pages, and marketing emails. They’re factors you need to be implementing across the board. For example, if you’re going to charge anything for your upcoming webinar, conference, eBook, or study, try making it free for the first 100 people to provide an email address. This will actually increase the assumed value of the piece of content (in the long run, anyway) and increase the chance of those first 100 spots going fast and spreading virally. Even in your blog content, you need to induce interaction through urgency (even if the urgency isn’t real). “Write for your reader” is one of the most tired phrases in our business sector. But that doesn’t mean it’s not true or essential when writing to drive conversions. When creating content, only when that content genuinely appeals to the needs, concerns, and issues of your reader will you end up with a conversion. Segmenting your audience: Sometimes you need to exclude part of your readership to speak “one-on-one” with another part. Consider creating sector-based eBooks (also awesome for easily segmenting leads) that work through a particular strategy, with sector-specific examples given. Cover your bases when it comes to varying experience levels: In particular, I recommend one out of every five blog articles be written for the advanced reader. This is because I recommend writing theme-based content that can be compiled into an email-gated eBook. Yes this excludes readers, but it also makes your communication with another part of your readership more intimate and personalized — something they’ll respond well to. Root your content in reality: Keeping your content relevant is not only about focusing on your audience, it’s also about focusing on the world outside your business domain. Keep in mind holidays, seasons, sporting events, and anything else your reader could possibly be thinking about in their real (offline) lives. Not only does it increase the chance of engagement, it increases how personable your business comes across (increasing potential trust and, thus, chances of a sale). Clear, straightforward copy and content is how you communicate value in terms that will be understood by your entire audience. If your content comprises paragraph after paragraph of nothing but your own thoughts on the newest marketing theories, you might generate readers, but it’s unlikely those readers will turn into leads — or customers, either. The first article I wrote for CMI was about Mark Schaefer’s content shock theory. While I could have (and did with my colleagues in the office) simply discussed the idea of content shock, what it meant for content marketers, and my own opinions on the matter, I tried very hard to steer clear of this in the article itself. Why? Because, in order to write content that increases awareness of your brand, you need to write content that benefits your reader, rather than content that simply informs them. Explain it in easy-to-understand language. Explain how it affects your reader. Explain your recommendations (bullet points or check-boxes) on how to approach, or benefit from, the issue. Discuss how you think this issue will affect your reader in the future. Provide relevant email-gated content as the article’s call to action (CTA). Are you trustworthy? Why should someone believe in your recommendations or, more importantly, trust you enough to buy or download something you say they should? Great content reduces the anxiety of the reader. Not just by educating them about something they’re concerned with, but by convincing them that the words they’re reading come from a credible, experienced source who understands their needs and wants. Empathize, don’t just sympathize: Put yourself in your reader’s shoes. What issues do they have? Have you had those same issues? Describe how you overcame the issues they’re facing. Perhaps talk (subtlely) about how your company’s tools, product, or business helped you (or a current customer) address similar problems. Tell a story: Show you’re more than a robot by using anecdotes, fun metaphors, and analogies when creating content. Integrate your real life into your blog content by sharing personal experiences your audience can relate to. Show yourself: Feature a headshot or brief author bio at the bottom or side of your blog. Ask for feedback, and be open to questions. Don’t be afraid to express frustration or show emotion: Test this one (and keep in mind your content creating persona). Content should be focused on a single “ask,” rather than multiple requests all at once. Just as with landing pages, you’ll increase conversions by guiding readers along the path you want them to take, and keeping them from getting sidetracked along the way. Where this issue pokes its head up most often is in link building within content. While blogs chock full of links are great for SEO, this can actually detract from a page’s conversion rates, as following these links can take readers away from your page before they reach your primary call to action. Re-using statistics from your infographics, eBooks, and other email-gated content is great, as anytime you’re driving blog traffic toward becoming a lead you’re doing something right. But any link that sends a reader to an unrelated, un-“optimized” blog article is a link that is, in my opinion (and I welcome the comments this might generate), a waste of effort. In my sector (B2B and software as a service), it’s not uncommon for a business to work with name brands while their own is still less than famous. It’s not uncommon, either, for good content marketers to interact on a personal level with industry influencers, as they strive to become influencers themselves. If this is the case for you or your business, you need to take advantage of it. Your readers, blog subscribers, and half-nurtured leads are far more likely to be convinced of your business’ legitimacy if they see you associating with someone they recognize. Push for a podcast, interview, or webinar with a well-known influencer (after you woo them for a while). Give a well-known influencer access to your tool or product for free in return for an honest testimonial or endorsement (or, better yet, a how-to guide). These kinds of interactions and relationships are awesome for increasing brand awareness and should be nurtured carefully. But don’t try to develop so many relationships that you can’t maintain them. Relationships with influencers are like taking care of a plant: Forget to water them for long enough and they’ll die of thirst. But water them too much and their health will suffer just as surely from overindulgence. This is one you need to test fully, but it’s worth trying, nonetheless: If you know your niche market’s primary pain points, don’t be afraid to push buttons that will make your audience more aware of them, as well. These kinds of questions (the questions your readers may be avoiding asking themselves) can not only pique their general interest but may also increase their desire for any solution you might be providing. Does your tool measure the ROI of social more accurately? Or are you promoting an eBook that offers tips on gauging the effectiveness of social media? Now would be a good time to push it. I’m not joking around with that 90 percent rule. Don’t get flustered: You can still generate those vital inbound links with your content, and can still promote your business in the sidebar, banner, in mail-outs, and in that “Download Our eBook” CTA at the bottom of your articles. Just don’t do it within those articles. And, in those sidebars, banners and CTAs, make sure you always give legitimate reasons why your business is able to actually benefit those who do become customers. Not only will this decrease the chance that people will get get scared away by your spammy content, but it also increases the likelihood that they’ll share your genuinely advantageous product info. Want virality? This is how it’s done right. Notice I said the “right” CTA. That’s because I’m going to assume you’re already including CTAs in your content (and throughout every other communication point in your sales funnel, from social posts to unsubscribe pages). But the “right” CTA makes the difference between someone being inspired by your content’s insight, eloquence and information and deciding they’d like to become an email subscriber or start a free trial, and someone being inspired, but deciding to simply bookmark your page for later perusal. Hopefully these 10 tips have inspired you to test or tweak your own content creation strategy. Remember that as you’re optimizing for SEO and SMO, you can also be optimizing for conversions. Have you utilized any of these strategies? Let me know how it went in the comment section below! James Scherer is a content strategist at Wishpond, a platform which makes it easy to create complete marketing campaigns from a single tool. Connect with him on Twitter.